After much surfing of the web I found Indy's site. I'm very impressed with not only the selections here but the great customer service. There was a UPS snafu but Indy took care of it. Great man. The suit is stunning, I dare say. Funny, I feel like having a mint julep every time I wear it. 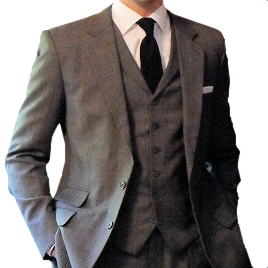 People think it's a very "dashing" suit. I try not to break into a Sean Connery imitation when wearing it :) I can dress it down by wearing jeans with the vest, coat, open collar and loose tie ala Daniel Craig.